No sweeter words in the human language then “new mattress” or rather discount tempurpedic mattress. A million years ago we bought a new mattress. I think it was at our first tour duty, so more like 8.5 years ago, but it feels like a million. It was a standard $800 pillow top. I cannot honestly remember back if it was comfortable or not. All I know is we lost the poor thing in the great Haas fire of 2007 and went on a search for a new one. DH and I like different kinds of mattresses. I prefer to lay on a cloud of pillows or cotton candy fluff and he is most comfortable on a rock. Or a slab of concrete. We ended up coming to an agreement on a mattress back then but now, less than 2 years with it, we are both suffering with creaks and cracks on our bodies. DH’s legs go numb at night and it literally has inverted lumps on both sides. We have been cranky a lot lately not getting sleep. DH is sleeping in one room and I am in the other because our mattress is too uncomfortable for both of us. The guest room mattress at least allows DH to get to sleep and I then move to the middle of the bed and its less suffering for both of us. Finally we have had enough. We started out searching mattresses, which of course led us to that whole Sleep Number Mattress incident and we finally settled on Tempur-pedic being the best solution. If you have any idea what its like to agree to a mattress that ends with the word “thousand”, it’s scary. VERY scary. This mattress costs as much as I owe on my SVU still. Tempur-pedic is notorious for not offering discounts and all furniture stores carry the same lines at the exact same cost. Its really about finding the best financing, not the best deal. Here is a tip to get a discount on Tempur-pedic: We learned that if you get a doctors prescription note, you don’t have to pay sales tax. Its very easy to get one when you have bad back and leg problems like my DH, so if you are considering a new mattress purchase, talk to your doctor first. For the past few weeks, we have been searching nonstop for good financing and going back and forth about this purchase. Finally we found a furniture store in Florida whom is no longer selling Tempur-pedic and were getting rid of all their floor models, including one that was only a week on the floor demo bed. Tempur-pedic gave them permission to get rid of them so they discounted them all. When I called, they had two left at 50% off. 50% off Tempur-pedic is unheard of. When we called to talk to the furniture store, they basically said the price points were too high and they were not going to carry the line anymore. Which translates to “this mattress is too expensive to sell in this crappy economy“. Not only did we get 50% off, but they are giving us the box spring for FREE because they said they have no use for it now that they are clearing these out. Now its going to be our Christmas-Birthday-Halloween-Easter-Valentines Day-Anniversary-Birthday and Tax return gift, BUT I can’t wait. They let us buy it over the phone and are driving it in town tomorrow from Florida. I feel like a kid on Christmas. Or an adult ready to throw away the sleeping pills for some REAL sleep finally. Tomorrow night I will be sleeping on the Temperpedic Celebrity. Do not expect me to show up to work Wednesday Morning. « Sleep Number Mattress: FAIL! Good morning, shouldn’t have to be just a “saying” or “quote”. My husband and I have been in the mattress industry for over 15 years. We recently opened a mattress store in Fort Lauderdale florida (I see your from florida) At our store we carry only chosen brands to assist people with a great nights sleep. We do not sell a mattress we sell healthy nights and happy mornings. I would like to mention most stores will sell “floor model” close outs for a great price, however you are risking the return policy most stores have in place so do your research when looking for a mattress. At our store, we do the research for you, with the help of our great manufactures we design and promote our own lines. Their are national chains out there which are just “cookie cutter” stores who sell what ever the manufacture can give at a low price. We are the opposit we design a product with the customer in mind i would like to mention our store does sell a lot of TEMPURPEDIC and 98% of all customers who purchase a TEMPURPEDIC are happy with their purchase however, Trisha if you are still having issues I would like to recommend a product for you to try which is the product I sleep on because I have recently been diagnosed with spinal stenosis, and herniated discs in both my cervical, and lumbar regions. That product is PURE LATEX BLISS. Latex has many great qualities and instead if a sink hole feeling you actually get a “bounce” back feel. Talalay Latex also helps with allergy issues, protecting you from mold, dust mites, and mildew. There are many types of latex, but I recommend only TALALY- due to the anti microbial benefits, and also the durability and consistency of feel. DID you know that TALALAY LATEX was made from a tree, the rubber tree which they extract the “rubber sap” just like a maple tree. It’s a beautiful process and Pure Latex Bliss keeps the product as organic as possible without the added chemicals! You can go to their website at http://www.purelatexbliss.com or http://www.blissapedia.com they also have a store locator to see where you can test a model. Trisha I really hope this blurb helped you and others. Buying a mattress is all about feel, comfort and waking up refreshed. Most stores offer special financing we offer 2 types for most customers. SLEEP HAPPY, and go to Mattress Xperts- not cookie cutter national chains, most ma and pop stores can offer better product at better pricing. I am glad you asked. 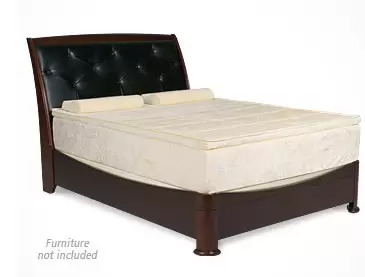 I loved it for a long time but to be honest, my back has gotten bad on it..I know its the mattress cause if i sleep in the guest room or a hotel it doesnt crack as much. I am not old..just 34 and i have no major medical issues just so you know. My spouse still likes it but I personally would NOT buy a new one. We have a TempurPedic that we got as a wedding present. I’m starting to have the same issues as you, Trisha, and we are the same age, basically. Even though this is supposed to be “super” material I have started to notice indentations forming on the mattress. It’s so disappointing. The thought of buying a new mattress is stressing, especially when you can’t afford it. If you find a better one I can’t wait to hear about it. The best bed I’ve ever slept on was a Westin Bed at the Hard Rock Hotel in Chicago. I was also 5 months pregnant at the time so that really impressed me. We haven’t had a new mattress in about 10 years. We’re on the hunt too. I’ll be interested to hear how you like the Tempur. I was told they’re not good if you move around a lot because the foam takes time to form to your position, and they get hot. We’ve been looking for a mattress for a year because we’re having a hard tiem buying a mattress that ends in thousand too. It would bring tears to my eyes too. I bet you sleep sooooo good in it! I love me some Tempurpedic! My hubby and I are JUST about done paying our interest free 36 month financing off as well… I think it’s definitely one of the top 3 purchases ever made… and MOST definitely got me through my pregnancy without killing somebody. Hey, did you get the headboard that’s shown in that pic too? Wishing you both many years of peaceful sleep and gum drop filled dreams. That is an awesome deal! My hubby sells mattresses, and there is also a line called Kool Flow, which is basically the same thing, but it will keep you cooler when supposedly Tempurs make you warm, you’ll have to let me know if it’s true! They are SO outrageously priced, even working there will not get us a good deal! Anyways, I’d love to hear your thoughts on the Tempur, so I know myself what others think of it! Sitting here is awe. Jealous, oh so jealous. Can you come here and get us one of those for 50% off??! My husband really wants one but I nearly passed out when I saw the price. Seriously. Plus we’re both awful at negotiating. I usually get the giggles when I try. Wow, you must be the Queen of the Sales Huntresses! All bow to Queen Huntress!! You may even be able to get your insurance company to pay for the matress depending on the perscription and your insurance. I am eager to hear what you think! We have had our Tempur-pedic for three years now. JUST paid off our zero percent, 36 month financing on that sucker. LORD. It will take you a few nights to get used to it but you will like it! Keep us posted. xo. thankfully w/ the discount, we didnt need mucn financing. I just pulled half out of savings and paid it and then put the rest on our points card. congrats!! that is going to be SO nice to enjoy. I’m so happy for you guys! They are super comfy and my hubby and I are also opposites, only I like firm and he likes fluffy 🙂 We found a Sealy Firm but Soft (I forget the exact model name) It’s been a lot harder to get out of bed in the morning since it arrived 2 weeks ago! Oh wow what a great deal! I didn’t know about the tax thing either, Jeff has a horrible back (Rheumatoid Arthritis and has had 2 back surgeries already) so that is nice to know the next time we need a new mattress lol. I had no idea about the doctor’s note thing. Very handy. And yes, I am jealous. I know our mattress (very old and a hand me down) is doing a number on my back and legs. Sometimes I sleep on the couch because it is more comfortable. I am so incredibly jealous! We’ve looked at buying a temperpedic mattress because ours is awful but we recently settled for a temperpedic mattress topper. I would love to find a great deal like yours! We bought our mattress 5 1/2 years ago after we were in a car accident…it was our first new mattress and were super excited about it. The thing is a freaking piece of crap! I can’t stand it and I cannot wait to get a nicer mattress. So color me amazingly freaking jealous over here!!! Hope you get a nice well deserved sleep tomorrow night! there is nothing that beats a good night sleep or the joy of getting a new mattress. We’ve had a tempur mattress for about 7 years now. My husband wrote some promo materials for them so they did a contra deal. Oh, how we love our tempur. We still get into bed at night and say, “Oh the tempur!” The hardest thing about it is going away – there’s nothing like a tempur-pedic. You will LOVE it. It might take some getting used to, but there will be no looking back. Sleep well. wow- I am in LOVE!!! I soo want one of those!